Father’s Day is fast approaching, and I’ve been racking my brain trying to come up with the perfect present for my husband. So, of course, I turned to the internet, and found some really great ideas. 1. You just can’t go wrong with bacon. 2. The Diaper Dootie Tool Belt. 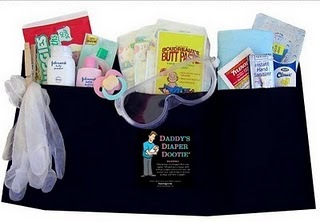 This puppy comes pre-stocked with everything you’d need to change the foulest of diapers, including a facemask, goggles and rubber gloves. The designer tool belt also comes in other fashion colors, including white, but really, how practical is that? If you’re going to get one, black is definitely the way to go. 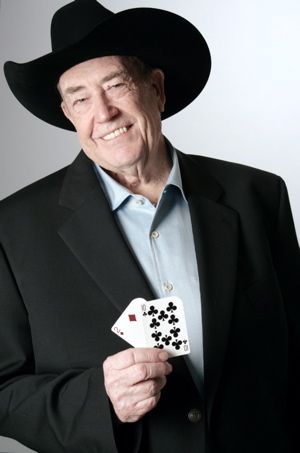 If you’ve never heard of Doyle Brunson, he is one of the great legends poker. And personally, I think he’s adorable. 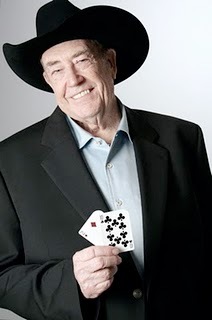 There’s something about a man sporting a cowboy hat and a million dollar smile that I can’t resist. Since Jay’s already got a pretty great smile, I was thinking about buying him this cowboy hat, so he’d look more Doyle-ish. Who knows, maybe it would bring my husband good luck at the poker tables, too. This handy little cheat sheet helps him remember your ring size, favorite colors, favorite flowers and more. And it’s credit card sized, so it would fit perfectly in that bacon wallet. It doesn’t have a spot for birthdates or anniversaries; you may want to consider jotting those on there as well. Truly a thoughtful gift. 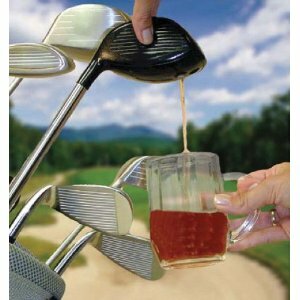 When I saw this golf club beer dispenser, I literally oohed. Jay loves golf, and he loves beer. What could be more perfect? This driver holds up to 48 ounces of his favorite brew. And apparently it does not count as a regulation golf club, so he wouldn’t need to choose between his regular driver and his “beer driver”… he can bring both! I don’t usually buy my husband clothes, but this shirt caught my eye for some reason. I think he’d look great in it. And he will wear it. Because I said so. So here’s my dilemma. All of these items are currently sitting in my shopping cart, and I seriously can’t decide which one to actually give him. Who knows…perhaps I’ll end up buying them all. I truly think every single one of these would be like the gift that keeps on giving. What are you giving the dad in your life for Father’s Day? Wow! Those are all cool! My husband needs a new wallet so badly because his actually has velcro and it embarrasses me. 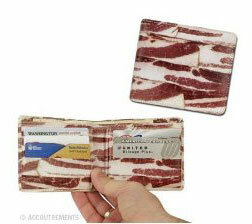 Sadly, I don't think the bacon wallet would improve that feeling. :)He needs that cheat sheet though, cause my favorite flowers are tulips and he has NEVER gotten me any! Shame! Bethany, this may be one of the funniest comments I've ever received. I'm not sure what is the lesser of two evils; the velcro or the bacon wallet. I guess it depends whether his current wallet has a camouflage print as well as velcro. Miss Marina… I checked out both of those sites, and they are fantastic. Those blow my bacon wallet out of the water. Thanks for the tips! OK, that bacon wallet is just nasty. 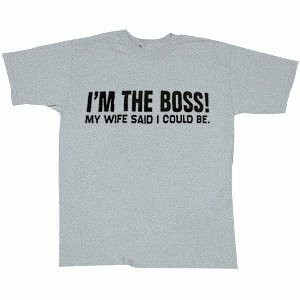 I like the "I'm the boss" T-shirt. I'm going to check out those other websites too. Fun ideas. I'm too lazy to get creative. I got my hubs a watch. Boring. But he is a watch guy. And a pen and a shoe guy. He's easy actually. He needs one of those cheat sheets for me though. I'm picky! Ooo now I want bacon. We are big fans of bacon in this house.